She might be a month off her third birthday, but the winner of last night’s BGBF Sprint at Harlow has crammed plenty into a dozen career races. Drawn trap one in the final, the Keith Elliott owned and bred Ballyoak Petal went unbeaten through the £4,000 event when leading home Queen Dawn by two lengths in 14.62 for the 238m. Things had started moderately enough when Petal was beaten in her first three races for Keith. She switched to Kevin Hutton and secured her first win in the notorious Produce Stakes heat where King Turbo had his card marked. She went on to reach the final, having won her semi final in 28.72 for Swindon’s 480m. Petal only raced once more before coming in season and having a litter of pups in December. With Keith unwell, he asked his good friend and fellow trainer Dave Lewis if he would take over Petal for a return to racing. It didn’t all go to plan with Petal breaking a metatarsal on her second trial back. But the pair persevered and Petal showed all was well with a 14.68 Harlow trial, followed by the three winning races in 14.66, 14.70, and 14.62 in the decider. (On calculated times, all four runs were within seven spots of each other). Dave said: “Keith recognised Petal’s potential early on but realised that she doesn’t run Poole. 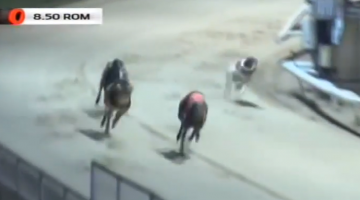 The 480m at Swindon was right at the end of her limit but she has great early pace and led King Elvis to the second bend in the Produce Stakes Final. Petal was from a July ’15 litter by Slip The Lark out of Ballyoak Alice. Seven of the eight pups reached the track with sisters Ballyoak Flower and Ballyoak Badger also winning opens. Keith Elliott said: “Badger has since produced the first litter by Dorotas Wildcat. Petal had eight by Aero Majestic and will be reared by Bob Smith.